This set of sixteen elaborately Engraved Natural ABC Blocks is indeed an heirloom set. Crafted from .. 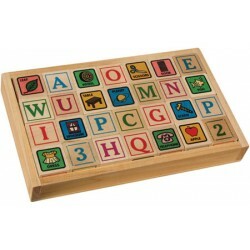 This set of sixteen elaborately Engraved Natural ABC Blocks with Maple Tray is indeed an heirloom se..
Our wooden ABC Blocks are a fresh interpretation of a classic toy. 28 solid blocks feature letters, ..
28 solid blocks nest comfortably in a sturdy tray. Our wooden ABC Blocks are a fresh interpretation .. This set of sixteen Simple ABC Blocks is all natural. Crafted from locally sourced, sustainably harv..